Physical Therapy Day at the Capitol: What were your thoughts? PTAG recently organized 2015 “Physical Therapy Day” at the Capitol on Wednesday, Jan. 21, 2015 to discuss the health and cost saving benefits of physical therapy services with legislators and their respective staff members. In 2015, PTAG is championing the mantra of “doing things differently” and has been furthering its mission to involve and engage Georgia’s physical therapy community in legislative initiatives that will not only affect themselves and their patients, but also the health care industry as a whole. With that in mind, we have two guest blogs that showcase the excitement of event attendees at “Physical Therapy Day” at the Capitol. Enjoy! Not every physical therapy or physical therapy assistant student becomes involved in his or her professional organization, locally or nationally. It is even less common for students to be directly involved in the legislative process related to their state’s physical therapy practice act. However, on Wednesday, January 21, 2015, over 200 physical therapy and physical therapy assistant students had the opportunity to voice their concerns and experiences directly to their state legislators during Physical Therapy Day at the Capitol. This was an important day for both professionals and students since it was not only a chance for participants to hear and learn more about the modernization of the practice act, but also an opportunity to interact with other participants on how we can positively impact the future of our profession. Our presence at the Georgia State Capitol, demonstrated to our legislators the impact a bill to modernize our practice act will have on how we practice, and ultimately, how it will impact our patients. This was a particularly important day for students. Students just beginning their education and those soon graduating were able to present their thoughts to their legislators and get a glimpse of how the legislative process works. This process of learning and becoming more involved in the profession through the legislative process is extremely beneficial, since it illustrates the goals of the profession, where the profession is headed, and challenges the profession faces. Once thoroughly educated about the issues facing the profession, I think as students we will be better prepared to make well-informed decisions in the best interest of physical therapy, and more importantly our patients. One thing I have realized through being involved in this process is it truly takes a team, rather than individuals, to mobilize the support needed to achieve change. As a student it is extremely motivating and exciting to see the passion and drive each member brings to the table in order to help the future of physical therapy. Further, I have realized how much more of an impact one can have once you understand the issues and goals at hand, even as a student. Unless we ourselves educate others on our profession and what we are capable of treating, nothing can be done to improve it. At the end of the day, it is our responsibility to our patients and the community to understand the issues we face and to work towards solving them together. Every movement begins with a vision, but it takes leaders and an entire network of supporters in order to make this vision a reality. The modernization of the Physical Therapy Practice Act is one of these movements that will require the support of clinicians, educators, consumers and students. Students play an especially large role since we are the next generation of physical therapists and physical therapy assistants. The modernization of our practice act will affect not only the way we practice once we graduate, but it will also impact our patients and the quality of care they receive. As a physical therapist, it will be our goal to deliver the best possible care to our patients to improve their function and quality of life. By being involved in the legislative process, we will be able to assist the movement to modernize the state practice act and ensure that in the future we will be able to provide this service to our patients. Most importantly, as students, we have the opportunity to set the foundation for how we will practice for the rest of our careers and how the community will receive our services for generations to come. 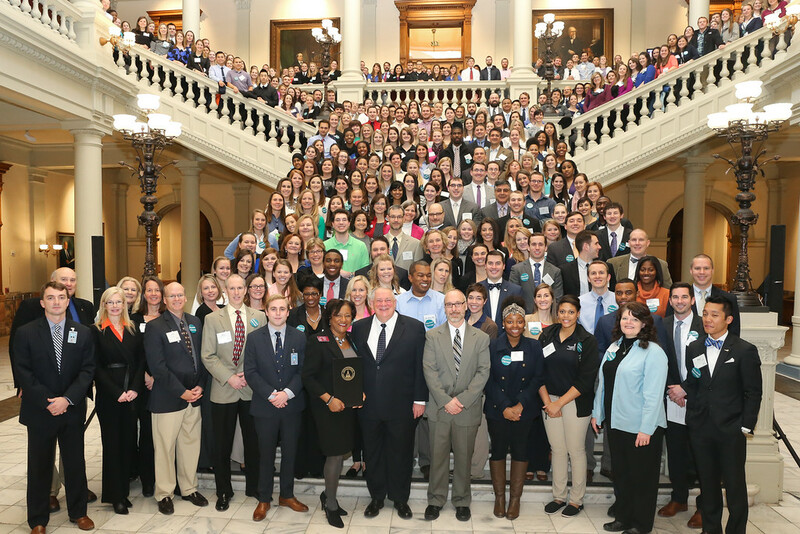 January 21st was “PT Day at the Capitol,” where PTs, PTAs and students from all over the state convene at Georgia’s State Capital in Atlanta to advocate for our profession. 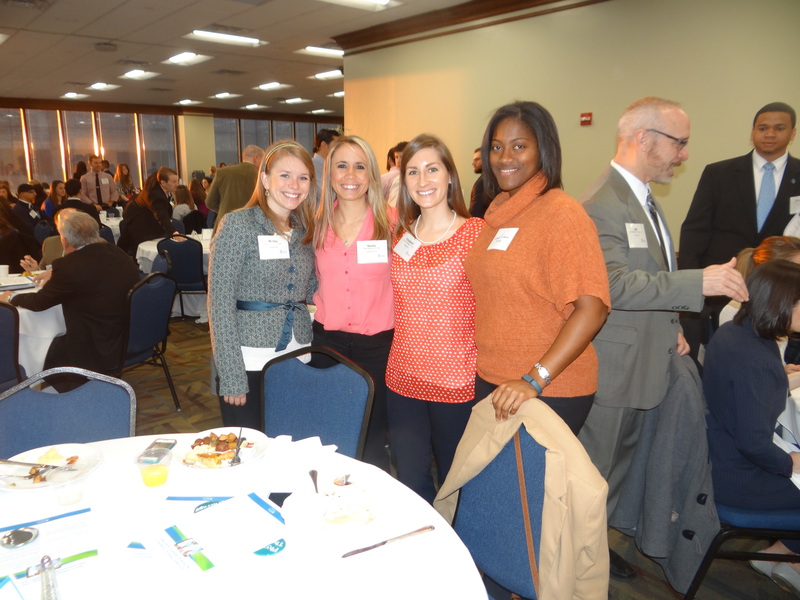 Last year over 100 people showed up for Capital Hill Day, but this year we had over 350 attendees. It was very exciting to see our group triple in size for this event in just one year! This was our second attendance at “PT Day at The Capital,” and this year made us so proud to practice in a state with such a strong passion for our profession. The day started with a breakfast that included a spectacular view of the city. Karen Bennett, along with other state representatives, began the morning by speaking to our group about their views on the importance of our profession. They assured us that they would work hard to advocate for our upcoming goal of passing a modernized practice act. Joe Donnelly followed with the current progress we were making with the modernization of our practice act. These speakers sparked a new energy that we had not seen yet in our organization. With that new energy, we walked across the street to the Capital with the same goal in mind: to make an impression on as many representatives as possible in order to improve healthcare services for our patients. It was an overwhelming experience to stand on those magnificent Capitol stairs surrounded by over 350 of our colleagues. We were not only there to advocate for the future of physical therapy, but also for the future of all our patients; our communities and patients deserve better access to healthcare services. That’s when we realized how important our presence was that day, because it ensured that our patients’ voices were heard. Over the course of the morning we both had the opportunity to sit with our senators and house representatives to educate them on the profession, how far we’ve come and what the modernization of our practice act would mean for the future of physical therapy and their constituents. Our presence that day enabled us to have a direct imPacT on key decision makers in our government. Our hope is that we were able to encourage them to help secure our profession as an integral part of the health care team. We were able to do all of this by staying involved with PTAG, and merely showing up. If you haven’t shown up already, there are more upcoming opportunities! Stay involved so that you can make an imPacT too! Please visit PTAG’s Facebook page by clicking here for event photos.